Obamacare on Trial: Case of the Century? Next week the Supreme Court hears oral arguments in the lawsuits challenging the Affordable Care Act. But is it really the “case of the century,” as pundits have started calling it? It’s difficult to say without knowing the outcome. Presently that distinction belongs to Bush v. Gore, a decision that may have truly altered history. Just think how the years after 2001 would have unfolded if Al Gore had been president. But Bush v. Gore didn’t change constitutional doctrine. The five justices voting to end the Florida recount and make Bush president wrote that their argument was "limited to the present circumstances" – in other words, that they were not making broader arguments about federal power over elections and interpretation of the equal protection clause. That claim provoked widespread derision within the legal establishment, which took the statement as a sign even the judges understood they were standing on a weak legal foundation. But the justices may get their way. 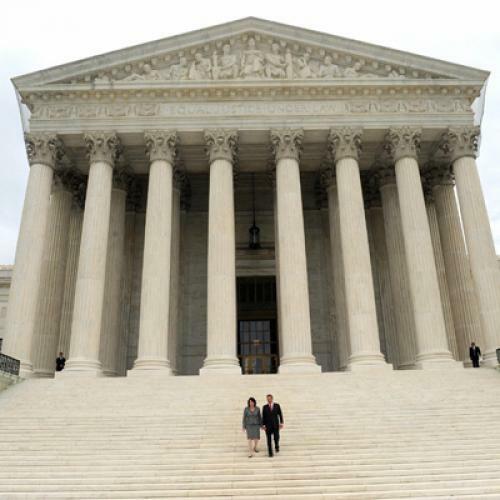 Most experts still consider Bush v. Gore bad law. Rejecting the Affordable Care Act could deprive 30 million people of health insurance, weaken the coverage for tens of millions more, and alter one-sixth of the economy. In those respects, obviously, it would be a highly consequential decision. But such a ruling could also have have far-reaching legal effects, the kind Bush v. Gore did not. At least in theory, the court could use this case to redefine the boundaries of federal power, in a way that the courts have not done in nearly a century. What are the limits of the federal government’s power to regulate interstate commerce? Defenders of the law claim that the individual mandate, which requires most non-poor people to obtain insurance or pay a penalty, falls within its power to regulate commerce among the states. A long line of precedents suggests the defenders of the law are right. Ever since the New Deal, the Court has held that federal power here is very broad. If it’s a legitimately federal matter, as the health care economy certainly seems to be, then the government has virtually unlimited authority to regulate it. A majority of the justices may disagree. But, if so, they’ll need to break new ground – that is, they’ll have to establish a limit on the commerce power that does not now exist. For example, critics of the law suggest that the commerce power does not extend to regulating “inactivity,” which is their term for declining to obtain insurance for future medical expenses. A majority of justices could decide to adopt that reasoning. But, if they do, the justices will be drawing a distinction that the court has never recognized before. No Supreme Court case has ever held or implied that Congress’s Commerce Clause authority is limited to individuals who are presently engaging in an activity involving, or substantially affecting, interstate commerce. ... To be sure, a number of the Supreme Court’s Commerce Clause cases have used the word “activity” to describe behavior that was either regarded as within or without Congress’s authority. But those cases did not purport to limit Congress to reach only existing activities. They were merely identifying the relevant conduct in a descriptive way, because the facts of those cases did not raise the question–presented here–of whether “inactivity” can also be regulated. In short, we do not believe these cases endorse the view that an existing activity is some kind of touchstone or a necessary precursor to Commerce Clause regulation. In order to strike down health-care reform, the new Republican Justices would have to change the underlying constitutional law, which they have proved themselves more than capable of doing. They have already cut a swath through the Court’s precedents on such issues as race, abortion, and campaign finance, and it’s possible that they will assemble the votes to do the same on the scope of the Commerce Clause. What are the limits of the “necessary and proper” clause? The commerce clause isn’t the only place in the constitution the government claims to find authority for the mandate. It also cites the “necessary and proper” clause. Specifically, the government claims that the mandate is “necessary” for carrying out its plan to regulate the price of health insurance (a goal even the law’s critics recognize is, by itself, legitimate) and a “proper” means for doing so. Here, too, the government has the power of precedent on its side. Chief Justice John Marshall famously established this idea in McCullough v. Maryland, which is to federal power what flour is to cake. Through the years, the court has largely stood by this broad interpretation, most recently in 2010 in Comstock v. United States. In that case, Chief Justice John Roberts was part of a five-member majority that ruled the federal government could take action “rationally related” and “reasonably adapted” to one of its explicit constitutional duties. The individual mandate would seem to meet those two criteria rather easily. Insurance mandates are certainly common for more voluntary activities, like driving a car or living in a flood plain. And, by enacting the mandate, Congress was following the advice of non-partisan experts, including those at the Congressional Budget Office, who said that a mandate was essential to maximizing insurance coverage and reducing the price of insurance through a system of private health benefits. Again, the Supreme Court could disagree. The justices can say whatever they want to say. But to do so honestly they’d need to revisit Comstock and, at least implicitly, McCollough. And Justice Antonin Scalia, in particular, would have to find some way to explain away his concurring opinion in Gonzales v. Raich, in which he stated "Congress may regulate even noneconomic local activity if that regulation is a necessary part of a more general regulation of interstate commerce" and when a failure to take such action might "undercut" legitimate regulations. This is precisely the argument that the administration and its allies make about the mandate: That, without it, regulations of the insurance industry won't work as well. Without a broad reading of the necessary and proper clause, lawyers for libertarians can start asking other questions – and, potentially, undermining other federal programs most of us take for granted. "If you accept [this] logic," Northwestern law professor Andrew Koppelman wrote recently, "then it is not clear how, say, the Environmental Protection Agency could survive, since there is no enumerated power to keep the country’s air breathable or its water drinkable." Ironically, some conservatives might also come to rue such a decision. After all, if it’s unconstitutional to compel contributions towards private health insurance, then surely it’s unconstitutional to compel contributions toward private investment accounts – which happens to be the idea many conservatives still have for replacing Social Security. As Simon Lazarus, counsel for the National Senior Citizens Law Center, noted last year in Slate, two of the conservative appellate judges who rejected these lawsuits cited that very possibility in their rulings. Is Medicaid coercive to the states? This is the sleeper issue of the case. Medicaid is the joint federal-state insurance program for low-income people. The states run the program, but they do so under guidelines set by the federal government, which provides a large portion of the funding. The Affordable Care Act expands Medicaid eligibility guidelines significantly, so that, starting in 2014, anybody with income below 133 percent of the poverty line can receive it. The result will be approximately 15 million more people with Medicaid coverage, according to projections from the CBO. The federal government is picking up the vast majority of this cost, at least for the first few years, but states would have to provide the rest and many don't want to do so. In theory, the states have a choice: They can always drop out of Medicaid altogether, since no law compels them to participate. But, in the lawsuit, states are saying the government is actually coercing them – in effect, making the states an offer they can’t refuse. As their argument goes, states have become so dependent on Medicaid funding for their low-income populations that the prospect of giving up that money is unthinkable, giving the federal government a nearly free hand to shape the program. Again, precedent is on the federal government’s side here: Past court decisions have established that federal funding is basically a “gift” to the states, one for which the federal government is free to set the terms. The justices could use this case to change that understanding, but if they do they’ll be establishing a principle that could undermine a lot of existing programs. If the Court holds that the ACA's Medicaid expansion is unconstitutional, such a holding could put any number of cooperative state-federal programs at constitutional risk. The most obviously vulnerable would be Medicaid itself -- even as it existed before the ACA's amendments to it. If the petitioners are right that the large amount of federal money at stake coerces states into accepting new Medicaid conditions by leaving them with no realistic choice but to accept them, then it is hard to explain why the same large amount of federal money does not coerce states into continuing to accept the conditions that have long applied to Medicaid funding. The many federal statutes that impose conditions on federal aid to education would also be at severe constitutional risk, because those conditions are attached to large amounts of federal funding that states may feel they cannot realistically turn down. These statutes include Title I of the Elementary and Secondary Education Act -- the most recent reauthorization of which was the No Child Left Behind Act -- and Title IX of the Education Amendments of 1972. Of course, it’s possible the court will duck these big questions altogether. It could still decide to rule that the lawsuit is premature, because the law has not taken effect yet. It could decide that the individual mandate is a legitimate exercise of congressional authority to levy taxes – an argument I have always supported but even some more liberal judges have eyed skeptically – and leave it at that. Or it could issue a broad ruling accepting the government’s case that the law falls clearly within established precedents, just as Silberman and another conservative appellate judge, Jeffrey Sutton, have. If that happens, historians will probably come to see these cases much as the legal establishment did until very recently: As a weak bid by conservatives to overturn legally what they could not block politically. But there’s no way to know until the justices make their decision. Update: I'll be writing about the case extensively in this space over the next two weeks. But my overall argument hasn't changed since last January, when I wrote a lengthy article on the legal issues in play. Also, I originally wrote that nobody cites Bush v. Gore, but an alert reader (via twitter) has informed me otherwise. I changed that reference, as well as adding a quote from Toobin's terrific New Yorker piece, which is well worth reading. Finally, Ann Althouse takes issue with my item because, she says, Bush would have won the presidency even if the Supreme Court had not intervened. "Ridiculous!" she says of my item. Althouse is absolutely correct that my statement went too far. Media recounts including only the "under-votes" showed that Bush would still have won and, at the outset, that's what Florida was doing. But Althouse is wrong to suggest the outcome was inevitable. Among other things, the judge overseeing the recount later told the Orlando Sentinel that he might have included "overvotes," as well. Media recounts including those ballots left Gore with more votes. (See this vintage Mickey Kaus blog item for more.) In short, there's no way to be sure. I have changed my wording above, to make clear the outcome was uncertain. Of course, that only strengthens the argument that the health care cases will prove more important if the court ends up finding the Affordable Care Act unconstitutional.